I don’t think that I could ever be accused of being intrigued by what celebrities do. By celebrities, I guess I mean actors and actresses. 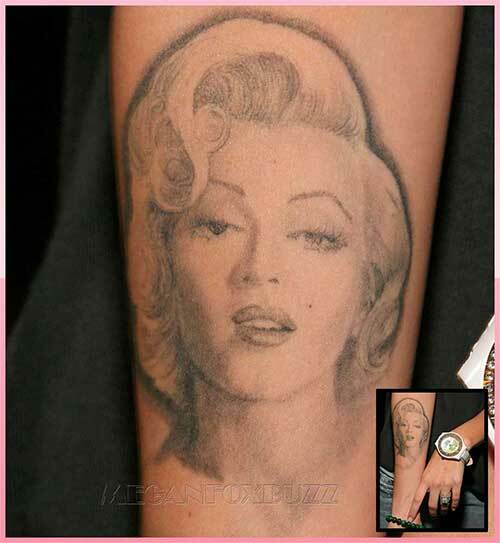 For this reason, you’ve probably noticed that there isn’t a lot of information on Tattoo Blog about which celebrities got which tattoo last Wednesday and so on and so forth. Don’t get me wrong, there has been the odd celebrity update on here, but in general, I tend to stay away from it. The photos in this news piece show that Megan Fox is definitely losing her Marilyn tattoo, although her other tattoos are still intact. Who knows why exactly she’s getting rid of Marilyn, but most likely it has something to do with Fox’s work for fashion icon Armani. It probably also has a lot to do with the constant makeup that Fox must undergo when filming, in order to cover up the tattoo. At present time, she hasn’t given any particular reason.